Now that we are sooooooooo close to remodeling our main floor (new floors and a new kitchen, yay!!) I have really been thinking about a new kitchen table. I have known for months that I wanted a new one, but knew it could wait until after our remodel. 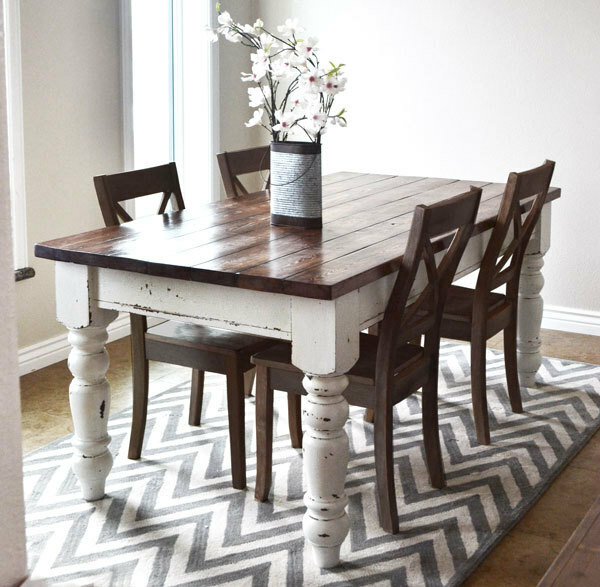 I found this table online from the very popular Ana White - gorgeous, right?!?! Ana's site provides the plans on how to make this table and while it does seem do-able, I wonder where my sweet hubby will find the time. I looked into the legs I would want from Osborne Wood and after pricing those out for a table and a bench (I want a bench for one side and then 4 chairs for the rest) it came to about $200, then I estimated what the wood would cost ($75) and then the paint and stains ($75) - this is all pure estimation, it could be more, or it could be less. So to build the table would cost us around $350 for materials alone. Then per Ana's instructions, you definitely need a power sander, which we do not have, so we could buy one for about $50. Now we're at $400 (or more, who knows) and we still need the most important factor to build this table...TIME. Which we just don't have with working full time and taking care of 2 kids. My hubby has already done so much around our house and will continue to do so after our floors get put in. Plus the weather is finally becoming nice that I know he won't want to spend his weekends building this table and I won't want to wait months for it. So we are looking at alternative options, AKA having someone build it for us. My SIL used a local company called Rustic Elements Furniture for her table & chairs so I am in contact with the owner now. You can see on his website that his tables really aren't too bad, if you want a standard 6 person table, it's only $550. It is an additional cost for the bench and the legs I want aren't considered standard so I am waiting to hear back on how much my table would be. But, if it is anywhere close to the $550 I really think this is our way to go! It will save my hubby tons of time and we can just focus on spending time as a family on the weekends. We have been doing so much DIY around our house that I think it's time we pay for something we want. I hope it works out with Rustic Elements and I hope I can share my new table in the near future!! !